Starting as a one-man shop in 1990, Jon Byers remains an active member of his five-person crew. This team of talented individuals works together to provide quality auto body, paint, and fabrication using the finest materials. 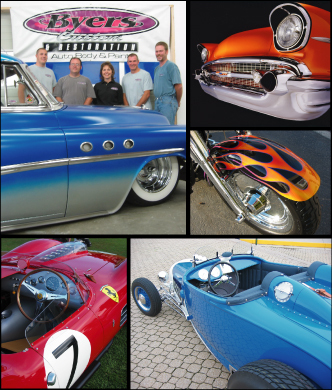 Whether your project is a quality street cruiser or a Concours show winner, we can provide the services for you. We have done all types of cars, trucks, motorcycles, boats, and even some non-vehicle projects. Check out our photo galleries. Customer satisfaction is a top priority at Byers Custom & Restoration with repeat customers and referrals being a large part of our business. Our work has been recognized nationally and internationally with awards ranging from "Best Under Construction" to "Best of Show."